Blockbuster plans to close 300 stores and cut 3,000 jobs. Video rental business Blockbuster plans to close hundreds of stores in the coming weeks and expects to shed thousands of jobs, the company said Tuesday. Blockbuster, which was bought by Dish Network (DISH) in 2010 after going bankrupt, plans to close about 300 stores and cut about 3,000 jobs, said Dish spokesman John Hall. The company will continue to operate about 500 stores in the United States, said Hall, who did not identify the locations of the stores slated for closure. He said some stores are being closed as their leases end, while others are being closed for under-performing. "We continue to see value in the Blockbuster brand and we will continue to analyze store level profitability and -- as we have in the past -- close unprofitable stores," said Hall, in an email to CNNMoney. Blockbuster has struggled in recent years to compete with Redbox, a DVD rental and digital streaming service provided by Coinstar (CSTR), and Netflix (NFLX), which offers movies and TV shows for digital streaming in addition to its mail order DVD rentals. 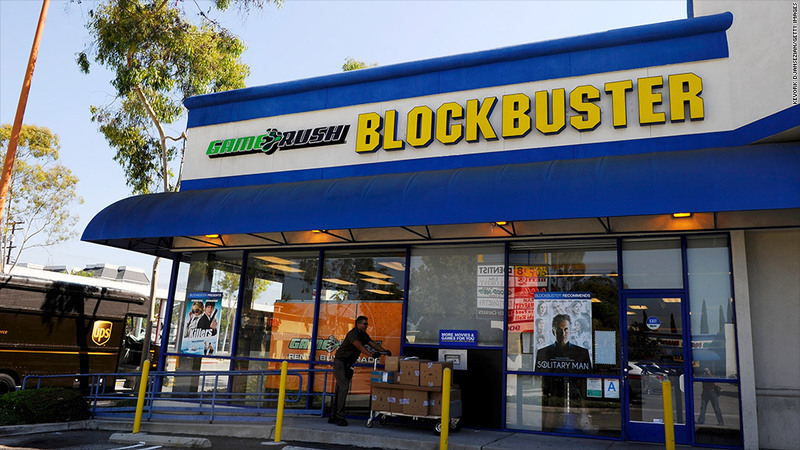 Blockbuster has attempted to counter these ventures with on demand digital streaming services, "Total Access" mail order plans, and Blockbuster Express kiosks.